The Finnish defences held in Joutsijärvi, along the Salla–Kemijärvi road. The Lapland Group transferred more troops there from Pelkosenniemi. Soviet forces repelled the first Finnish offensive in January 1940. Soon after, the troops of the Soviet rifle division (122nd RD) withdrew to Märkäjärvi. An enemy division attempted to continue advancing from Joutsijärvi to Kemijärvi in December. Detachment Roininen, commanded by Jaeger Officer, Major Vilho Roininen, repelled all attacks. 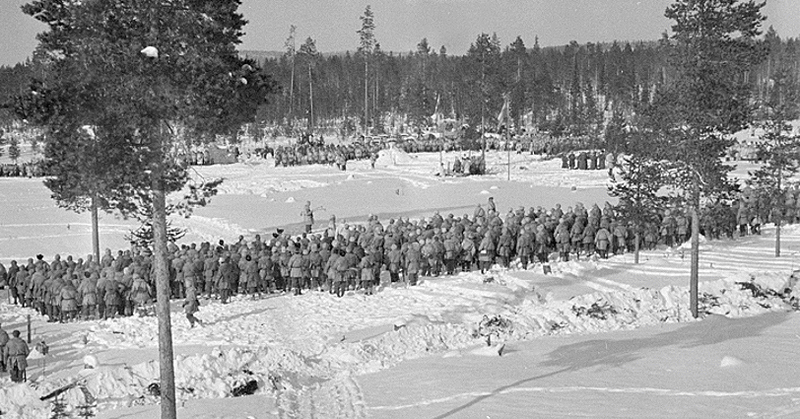 An enemy battalion advanced to the Finnish forces’ rear in Mäntyvaara on 20 December. Two companies from a Finnish battalion (17th SepBn) that had been transferred to the reserve from the front line had just arrived there. In the battle, which devolved into hand-to-hand fighting, the Finns forced the enemy forces to withdraw from the area. Approximately 300 enemy corpses were left in the area. On the Finnish side, 17 men were killed. A ski patrol in position in the Joutsijärvi area on 18 January 1940. SA-kuva. In the Joutsijärvi area, Detachment Roininen launched counteroffensives to the enemy’s positions with a company and a battalion. The Lapland Group increased its offensive strength in the Joutsijärvi area by transferring an infantry regiment (40th IR) there from the Pelkosenniemi–Savukoski area. The regiment was ordered to take over responsibility for the front from Detachment Roininen. At the Lapland Group’s order, the detachment was to attack the flank of the enemy’s positions from the north. The offensive started on 3 January. The Lapland Group aborted Detachment Roininen’s offensive the next day. A day after, an enemy battalion attacked the withdrawing forces of Detachment Roininen. Soviet forces began to withdraw from their positions in Joutsijärvi to Märkäjärvi on 13 January. The withdrawal was successful. 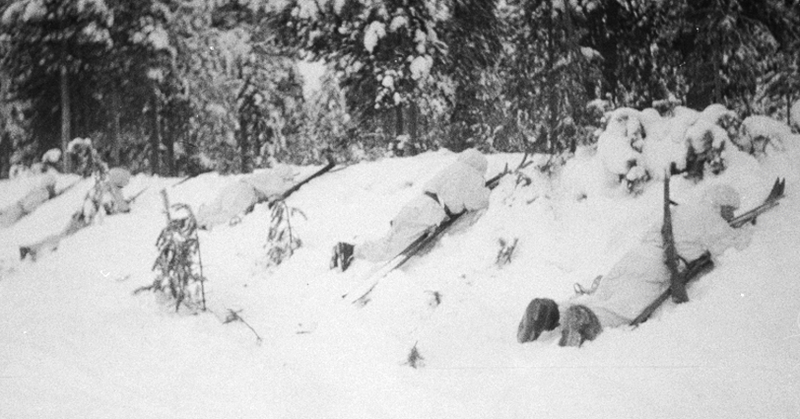 On 14 January, the Finnish forces found the positions in front of them to be empty. The next day, the Finnish forces started their advance, which was stopped at the enemy’s defensive positions in Märkäjärvi. Parts of a new Soviet rifle division (88th RD) had by this time arrived in the Salla area. The Lapland Group tried to break the enemy’s defence with the troops it had deployed in the Märkäjärvi area. The enemy forces held their positions. The front lines stabilised at Saija and Märkäjärvi until the end of the war. The bulk of the force was deployed in the area along the Märkäjärvi–Kemijärvi road, where Detachment Roininen and Perkiö’s infantry regiment (40th IR) took turns being in charge of the front. One separate battalion (17th SepBn) was deployed to the road leading south from Märkäjärvi, south of Pyhätunturi. In the Märkäjärvi area, the battle group Stridsgruppen Svenska Frivilligkåren (Stridsgruppen SFK), which was formed mostly of Swedish volunteers, took charge of the front on 25 February. It comprised approximately two battalions. The battle group also included Norwegian volunteers. The duties of Battle Group SFK’s commander were performed by the commander of the 1st Battalion, Lieutenant Colonel Magnus Dyrssen, alongside his own duties. The 2nd Battalion’s commander was Lieutenant Colonel Viking Tamm. The battle group’s commander, Colonel Arthur Nordenswan, did not arrive in Märkäjärvi until 7 March. The 3rd Battalion of the battle group failed to arrive at the front line before the end of the war. Both battalions of the battle group comprised three rifle companies, a Jaeger company, a heavy company, a battery, a ploughing platoon and a logistics column. The battery was armed with four 75 mm model 1902 field guns. The actual strengths of the battalions ranged from 1,200 to 1,380 men. The rifle companies included three rifle platoons and an anti-tank platoon, among other units. The actual strength of a company included 248 men, 27 vehicles, 20 horses and 10 sled dogs, among other things. The actual strength of a Jaeger company was 168 men. A heavy company was armed with heavy machine guns, anti-tank rifles and light mortars, among other things. The 1st Battalion of the battle group took up the positions vacated by the Finns along the road. The battle group’s left flank was protected by the 2nd Battalion, which was deployed as a reserve on the north side of the road while being one company short. The battle group saw limited action in Märkäjärvi. The volunteer group suffered its first two fatalities on 1 March. One of them was Lieutenant Colonel Dyrssen, who was killed by enemy artillery fire while inspecting the fortification at the front line. During the little over two weeks that the volunteer force of over 2,500 men served at the front, it suffered the loss of approximately 70 men, of whom approximately ten were killed by enemy fire on the last day of the war on 13 March 1940. In accordance with the peace treaty signed in Moscow on 12 March, Salla was left on the east side of the new national border. Märkäjärvi became the new Salla. A field service of Battle Group Svenska Frivilligkåren in Märkäjärvi on 17 March 1940. SA-kuva.